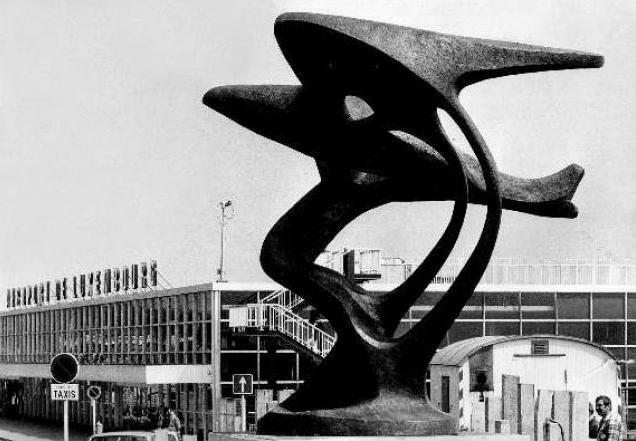 PARIS 2e: Quo Vadis Sculpture in Luxembourg? Quo Vadis Sculpture in Luxembourg? 0 Comments Published by Cedric Benetti on Friday, April 2, 2010 at 4/02/2010 09:17:00 PM. 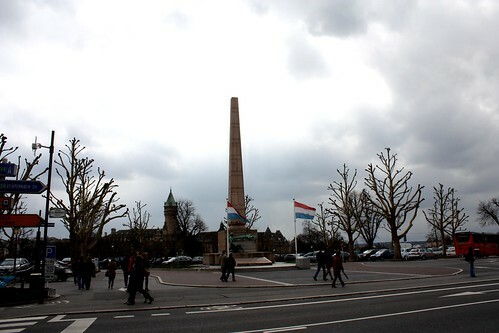 What may look here like a dark chimneystack is actually the tip of the obelisk that was until recently holding the most cherished national symbol of Luxembourg, the "Gelle Fra" (Golden Lady), a monument of peace and remembrance. The statue has been taken down and will be sent to China as a part of the Luxembourgish national pavillion of the World Expo... As if France would wrap up the Eiffel tower and send it off to the Chinese, by only hoping they will get it back in one piece and if possible undamaged. Politicians in Luxembourg sometimes don't really think at all before they open up their big yaps. 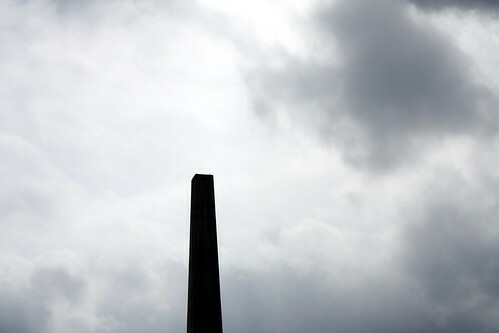 For six months now, Luxembourgers will have an empty obelisk to stare at, reminding them of the last time the sculpture came down when the Nazis pulled it down in order to break the national spirit of the country. Ah nostalgia! Some people nowadays would suggest to replace the empty spot for six months with mister Goebbels, the politician responsible for this cultural mess as the pavillion's general-commissioner, and by placing him in such a way on top of the obelisk that it would at least be sealing off one of the valves where politicians usually pull out their best ideas. Another fun moment in national sculpture news was a few weeks ago when reporters discovered a monumental bronze sculpture commissioned in the 70s for the international airport, lying face down in the mud next to one of the runways where they store trash metals and cow-poop tanks... the irony is quite positively nailbiting. After the news came out on the whereabouts of the sculpture, commissioned in 1977 for roughly 148.000 Euros, government officials from the ministry of culture were shocked, even though one day before no one cared or even knew where the sculpture had ended up. 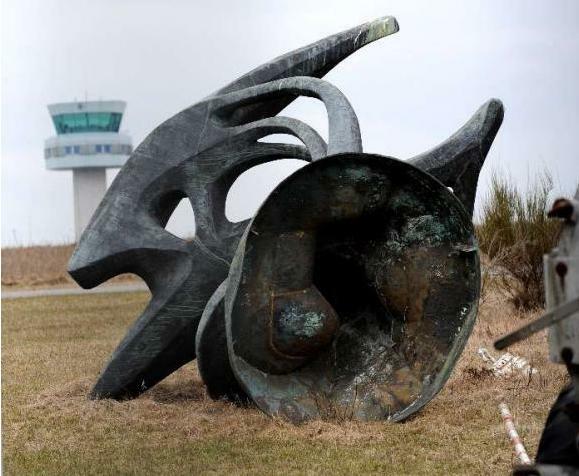 The piece will be restored and put back up at the new airport terminal in some time. This all leaves you wondering whether politicians in this country really care in any way about art, other than just using it as a bling-bling way to show off the nation or not care enough to keep at least a database of the art collections on public display. How on Earth did he get up there?